Ah, NetGalley. The reason I have a TBR Pile I'm suffocating underneath that I'm SO SO HAPPY about. I was planning on reviewing a book, when I realized I have a BACKLOG of reviews? I hope to change it all soon. Welcome to A Double Serving #10 of ARC Reviews! Blurb Description: Three girls. One week. One chance to start over.Maddie dreams of joining Sigma Theta Kappa, Baldwin University’s most powerful sorority, and rising above the people who walked all over her in high school—especially her boyfriend-stealing twin sister. Rush is Maddie’s chance to become the girl she always knew she could be—if she can survive Sigma’s brutal selection process. Imogen came to Baldwin to escape her wealthy family and launch her dream career as a journalist. But her Sigma legacy might just keep her tied to the past, while her crush on her new editor could upset her plans for the future. Cass remembers what Sigma was like before her fellow sisters put money and “Must Haves” over true friendship. By the time rush week ends, she’ll either save the sorority or quit Greek life—but first she’ll have to confront her feelings for her anti-Greek best friend Leo. Does he feel the same? Or will Cass’s commitment to Sigma keep them apart?The week before college is a fresh start—a chance to be your true self and find sisters for life. But rush means making tough decisions and facing rejection along the way. Maddie, Imogen and Cass have until Bid Day to decide whether they’re really meant to “go Greek.” The key, each girl will find, is figuring out who her real friends are. mentally impossible for me to ALWAYS be reading High Fantasies and Contemporary’s with Mental Health issues etc, and so books like Rush come as welcome breaks for me. I think there’s a movie about Rushing in colleges – I simply can’t remember the name at this point – which was primarily where I got my information about Sororities/ Pledging Greek and I felt like I knew enough to read this book. 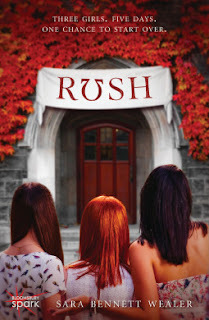 Told from three major points of view, Rush is a fun, light and slightly predictable read. Imogen Ash is the TOP pledge. A three generation legacy to Sigma Theta Kappa and New York Socialite, all she wanted when she got to college was a fresh start. Madeline ran from her boyfriend and sister cheating on her and is determined to prove to everybody who thought she was nobody that she could be accepted into one of the most prestigious houses in the country. Cass is a sophomore in the Sigma house, dreading the life. She thought pledging Greek was about sisterhood and equality and instead, found out it was about power and shaming. She’s determined to change the house and stand up for the underdog, all while trying to tell her best friend she’s in love with him. The book itself was nothing spectacular. All we heard about were parties, and then showers from Imogen and Madeline and from Cass how Pledging was pre-decided depending on legacy and other things. ALL the important stuff like Madeline and her Boyfriend/ Sister drama was sort of given a back seat. The fights were blown WAY out of proportion and I ended up really disliking Maggie and Imogen. All in all, a book worth a read if you’re into the sorority stuff! 3 stars. Blurb Description: In the gritty city of Dusk, seventeen-year-old Irina makes her living as the street magician Bantheir’s assistant. The job isn’t glamorous, but she loves the crowds, the shows, and most of all, the illusion of magic. 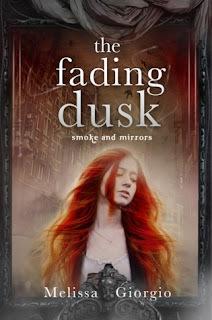 But Irina’s world is shattered the night she is arrested and charged as Bantheir’s accomplice to murder—murder by magic. Truth be told, I have NO IDEA as to what just happened. The Fading Dusk started off really well. I was very pulled into the story of the street magician’s assistant with her issues and there was a man claiming her master had stolen something. IT WAS GOOD. The characters became overdramatic, the dialogue overdone, and EVERYTHING WAS JUST OFF. Irina, with every one of her statements made me CRINGE. She’s supposed to be a hardened street kid (at least that’s what I assume you would be when you’ve spent your entire life on the streets. AND YET, she was like a naïve little delicate flower who trusted RANDOMN MEN only a few days after meeting them, behaved like a six year old snob and WAS JUST TOO SILLY TO BE LIKED. The story switched from a normal one to a mope in prison one (with an IDIOT councillor who ONLY KNEW HOW TO YELL. WHAT EVEN) to a love story to a mopey one to BAM Dark Magic and I WAS SO LOST? AND THEN THERE WAS A DRAGON. Like I said. SO SO LOST. The only reason I continued reading was that I SORT OF liked the twists and Captain Leonid, BUT UGH. I will unfortunately not be reading this again. 2 stars.